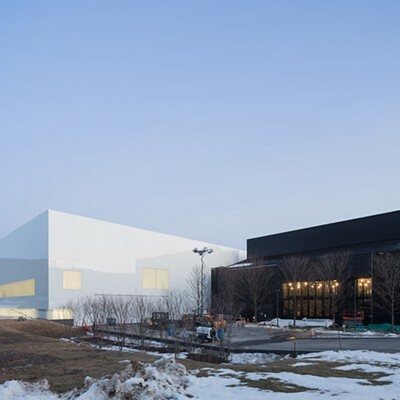 The Corning Museum of Glass opened its new Contemporary Art + Design Wing to the public on Friday, March 20. Following remarks and a ribbon cutting, those in attendance were released to explore the bright and airy space, which adds 26,000 square feet of exhibition area as well as a 500-seat live glass demonstration facility to the museum. 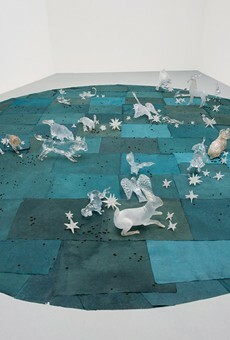 "Carroña (Carrion)," by Javier Pérez, is included in the new Contemporary Art + Design Wing at Corning Museum of Glass. The rectangular building, designed by Thomas Phifer and situated at the north end of the existent museum, includes a central freeform space divided into five connecting galleries by elegantly curving concrete walls. Because few pieces in the collection are meant to be hung on the wall, the architect was freed from the typical flat walls design of a gallery space. Massive glass panels make up one wall of the building, providing an all-seasons view of the one-acre Museum Green, which was prettily dusted with some powdered-sugar snowfall during our visit. The entire roof of the gallery is made of skylight panels in a seemingly random pattern of opaque, translucent, and transparent glass, producing a calming, subtly dappled, natural light in the galleries. This light is filtered through 206 thin concrete beams resting overhead on the serpentine gallery walls. Even on the overcast morning of the opening, the space felt like a bright sanctuary. Each of the displayed works has been given ample breathing room, with lots of space for visitors to negotiate the sculpture as well as one another, even on a busy day. Each of the five galleries and their contents are themed. 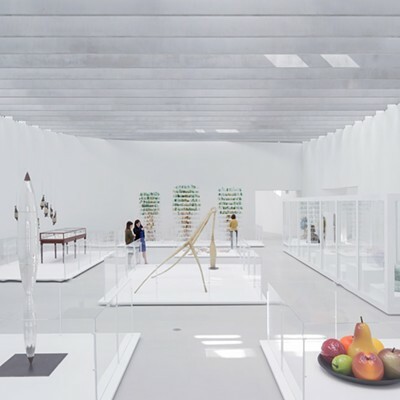 The Nature Gallery contains lifelike, oversized still lifes of glass petals and fruit, and Katherine Gray's "Forest Glass" — three trees made of green, clear, and brown drinking glasses arranged on shelves, which was inspired by the historic process of creating glass using timber-powered furnaces. The Body and Narrative Gallery focuses on some works inspired by the human body, and others inspired by human experience, memory, and story. A particularly elegant work in this room is Lino Tagliapietra's "Endeavor," a group of floating glass gondolas, nearly abstract and suspended dreamily from above. The colorful work is inspired by the boats that gather in the Venetian Lagoon for the annual Festa della Sensa. 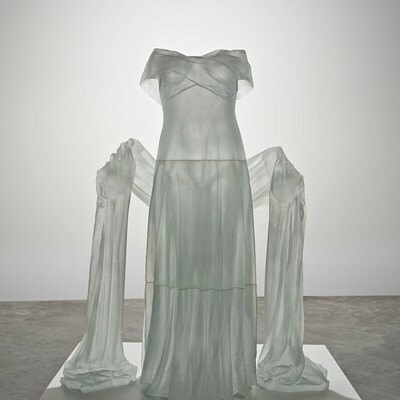 The History and Material Gallery presents works that focus on the manipulation of traditional forms in glass, and shows off its material properties. 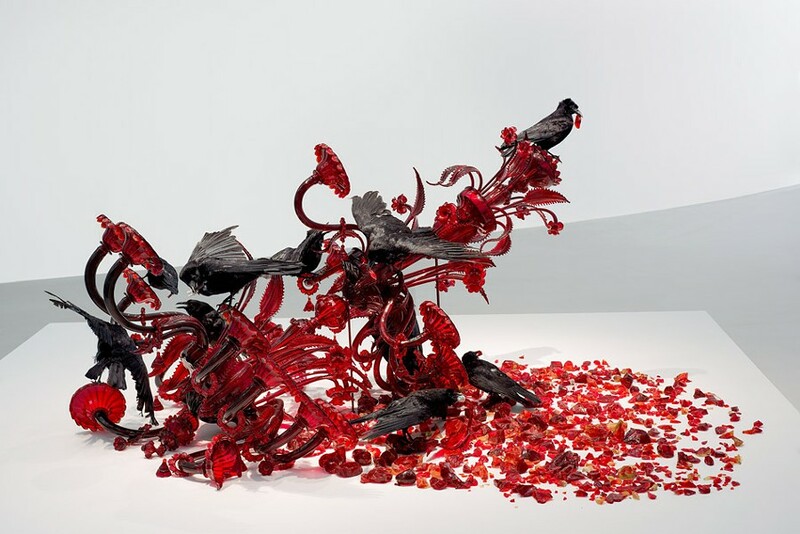 Located in this space, "Carroña (Carrion)," by Javier Pérez, is a dramatic work of a smashed traditional Venetian chandelier, its crimson bits scavenged by crows. The piece is a statement on the decline of the traditional glass industry in Murano, Italy. 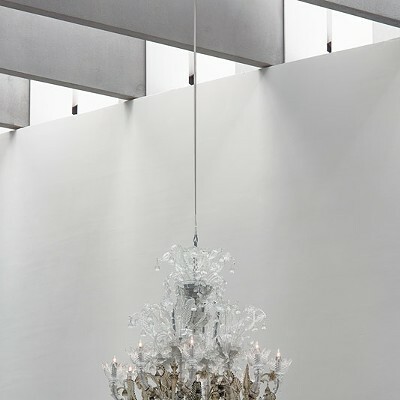 Other representations and artistic interpretations of this traditional glass chandelier provide for a fun hunt throughout the wing. The Design Gallery focuses on functional glass vessels, furniture, lighting, and design art from the last 25 years. 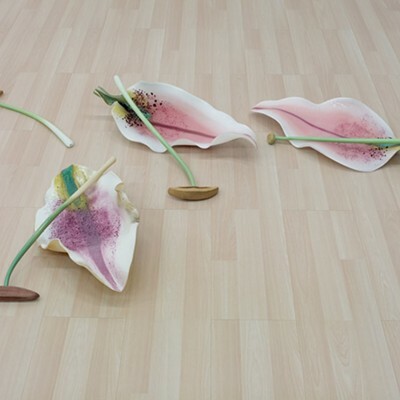 A changing sequence of large-scale installations will be presented in the Special Temporary Projects Gallery. And artwork is also smartly on display in the bright Porch, and in the Promenade, which runs along the wing's wall closest to the rest of the museum. CMOG is home to a collection of 50,000 works in glass, some of which were relocated to the new wing and given more space to shine. About 20 percent of the objects placed in the new wing are new acquisitions or are on display for the first time. Some of the highlights include works by Dale Chihuly, Roni Horn, Karen LaMonte, Beth Lipman, and Klaus Moje. 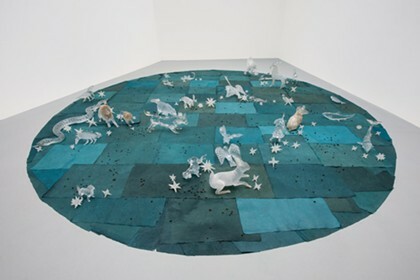 The space also includes pieces by artists not known for work in glass, including a glass tire by Robert Rauschenberg, and "Constellation," an installation by Kiki Smith, which is on loan to CMOG until March 2016. This latter work is installed on the floor at the far end of the Special Temporary Projects Gallery, behind a glass barrier, but it would have been nice to have been able to walk around the work and see a bit more detail. 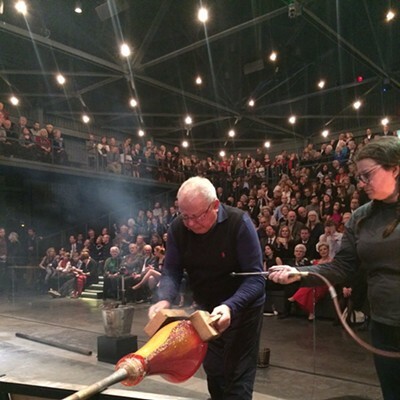 The first hot glass demonstration in the new, state-of-the-art Amphitheater Hot Shop took place at noon on opening day, with CMOG master glassmaker George Kennard, and several team members, creating a dragon vessel for an almost packed house. The space boasts seating for 500 people, between the amphitheater and 360 degree balcony; a spacious work space and stage; and four large-screen televisions to maximize detailed viewing. The Hot Shop can accommodate the creation of large-scale works, with a furnace that can melt 1,000 pounds of glass and 13 annealing ovens, among other amenities. Museum staffers aim for the space to be used for educational purposes as well as to serve visiting artists. While visiting the museum, I had the opportunity to gain a better appreciation for the dexterity and coordination involved in glass blowing when I was invited to make a small ornament (with a lot of help). I also got to explore the older collections, which boast items representing every thinkable way that glass has been used. Corning's collection spans the globe and history, from ancient vessels to of-the-moment artwork, and features displays on scientific and technological developments in glass and wondrous examples of technical and creative prowess throughout various art movements. And one fun but unexpected part of exploring CMOG is making a game of spotting how many mundane ways glass is utilized in the beautifully designed, industrial buildings — even the steps on some of the staircases are made of the simultaneously sturdy and fragile material.